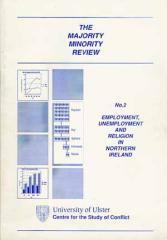 The Majority Minority Review is a series published by the Centre for the Study of Conflict, University of Ulster. The series will review published research on the comparative material conditions of the two communities in Northern Ireland. The first issue of the Review focused on education and some copies are still available. This issue examines research evidence on the relationship between religion, and employment and unemployment in Northern Ireland. Future issues in the series will examine research on the administration of justice and housing. The aim of the series is to provide an impartial commentary which will inform readers of up-to-date research findings and enable them to monitor developments over a period of time. The Centre for the Study of Conflict has a long term commitment to publish the Review. Each issue of the Review is advised by consultants. The Centre wishes to record its thanks to Dr Robert Osborne, Director of the Centre for Policy Research, University of Ulster, and Mr Robert Cormack, Social Studies Department, Queen's University Belfast, who commented on an earlier draft of this Review. The Majority Minority project is supported by funding from the Policy, Planning and Research Unit, and the Central Community Relations Unit. During the Civil Rights campaign of the late 1960s the issue of discrimination in employment in Northern Ireland played a central role. Since then the broader question of the link between religion and labour market opportunity has remained important and has led to two major pieces of legislation on fair employment, in 1976 and 1989. The Review examines the research evidence in a broadly chronological manner. Thus, the first two sections examine the broad patterns of industrial and occupational changes in Northern Ireland and the debates centred around the Civil Rights campaign. The third section examines analyses of the 1971 Census, which provided the first large-scale data on employment conditions and religion. These analyses pointed to Catholic disadvantage in the labour market and in the following period a series of research studies examined possible reasons for this pattern of disadvantage. This research is examined in the next three sections of the Review. 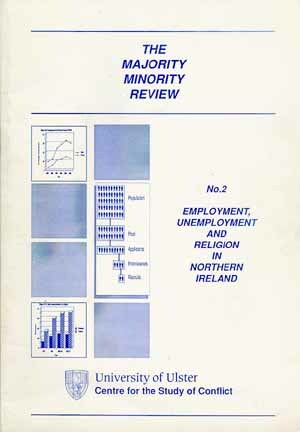 Section Seven examines analyses of the 1981 Census, which raised the question of an unemployment gap between Protestants and Catholics in Northern Ireland. Most of the research which followed focused on reasons for the unemployment gap and this is examined in sections eight to ten of the Review. The final section of the review examines some of the measures incorporated in the 1989 Fair Employment Act and points to a number of research areas where evidence appears to be limited. During the nineteenth century Belfast became the centre for mechanised industry, marketing and distribution in the north of Ireland (Hepburn and Collins, 1981; Hepburn, 1983; Geary and Johnson, 1989). In the first half of the century a textile labour force developed for cotton, later to be displaced by linen. From mid-century to 1914 there was a growth in skilled employment for men in shipbuilding, textile machinery manufacture and other engineering. At the same time, the mechanisation of linen production and finishing led to a dependence on low-paid female labour to the extent that, by 1901,43 percent of women and girls in Belfast were at work, compared with 32 percent for England and Wales. The growth in employment in Belfast coincided with the post-famine period in Ireland and attracted thousands forced off the land as a result of falling living standards: thus the population of Belfast increased from 19,000 in 1800 to 349,000 in 1901. Allied to this growth was an expansion of the Catholic proportion of the City's population from less than 10 percent in 1800 to 34 percent in 1861 and increasing inter-communal hostility. Hepburn and Collins have examined the structure of Belfast's industrial society in 1901 through an analysis of census information. They found a high degree of religious residential segregation such that 'Catholic' districts were more or less exclusively Catholic, while most 'Protestant' districts outside West Belfast contained sizeable Catholic minorities, varying both in size and dispersion. The only marked difference in house-hold structure was the greater extent of Catholic house-holds with women as the head of household. Examination of Poor Law (rateable) Valuation for houses indicated disproportionate Catholic disadvantage, particularly for those living in predominantly Catholic areas of Belfast. This finding was reflected in the social class distribution of the Catholic population which was inversely related to residential segregation, i.e. lower social class Catholics were more likely to be found in all-Catholic areas. This pattern of a link between social class and residential segregation was not so evident among Protestants. Also, the occupational distributions of Protestants and Catholics differed. Protestants were disproportionately found in manufacturing industry, particularly ship-building and engineering, while higher proportions of Catholics were found in commercial occupations and shop-keeping, and in the lower-paid category of general labouring. Hepburn and Collins noted that the social class distribution of Catholic male heads of households was not markedly different from the pattern in Britain: rather, the social class distribution of Protestants was more advantaged, largely due to their predominance among skilled manual and non-manual occupations. The emergent picture from Hepburn and Collins' analysis of the 1901 census was that the Catholic population of Belfast had settled into lower status semi or unskilled occupations, poorer housing and areas that had become predominantly Catholic (see also, Gray, 1985). At the same time there existed a Catholic middle-class, in all probability largely providing services for the Catholic community. It is perhaps significant that a pattern of Catholic disadvantage in employment in Belfast, the industrial heartland of the north of Ireland, could be discerned prior to partition. After partition the Northern Ireland Government followed the tenor of the times and did not adopt any pro-active interventionist policy to deal with social and employment differentials between the Protestant and Catholic communities. Indeed, there is some evidence that, in the early decades of the parliament's existence, the Government sought to restrict the number of Catholics entering Government service (Buckland, 1979; FEA, 1983; Whyte, 1988). Until 1965 (at which time the United Kingdom Government recognised the right of individuals to petition under the European Convention on Human Rights) the legal context within which the Northern Ireland parliament operated was provided by the Government of Ireland Act (1920) which stated that parliament could not "give a preference, privilege, or advantage, or impose any disability or disadvantage on account of religious belief or religious or ecclesiastical status". Also, section 8(6) of the Act prohibited both preferences and disabilities on account of religious belief when executive power was exercised (Osborne, 1981; SACHR, 1987). The purpose of this review is to examine the research evidence on this issue. Much of the evidence is based on the occupational and industrial profiles of the two communities in Northern Ireland and thus provides information on outcomes rather than causes. Nevertheless, analyses of empirical information allow for some assessment of the various explanations that have been offered to explain religious differences in occupational profiles. Most of the evidence to be discussed has been produced since the 1971 census, the first census in Northern Ireland to publish socio-economic data disaggregated by religion. The absence of large-scale empirical information on employment and religion prior to 1971 did not result in a lack of polemic. Claims that Catholics suffered discrimination in employment were raised by various nationalist groups at many times during the history of Northern Ireland. These claims were usually met with either denials or justifications by unionists. The claims were not accorded much attention outside Ireland until they were taken up by the Northern Ireland Civil Rights Association in the 1960s (McCluskey, 1989; Purdie, 1990). Reporting on the civil disturbances of 1968 and 1969, the Cameron Commission concluded that a sense of injustice had been a general contributory factor to the violence (see also Birrell, 1972). This sense of injustice was related to complaints of discrimination in housing and employment (Cameron Report paragraph 129) and "resentment and frustration among the Catholic population at the failure to achieve either acceptance on the part of Government of any need to investigate these complaints or to provide and enforce any remedy for them" (Cameron Report paragraph 229). The Cameron Commission did not consider the safeguards in the Government of Ireland Act to have been adequate. Action was promised by the Downing Street Declaration of August, 1969 (see House of Commons Cmd. 4154 and Cmd. 4158) which set out that "every citizen of Northern Ireland is entitled to the same equality of treatment and freedom from discrimination as obtains in the rest of the United Kingdom". Action was promised in five areas, including equality of opportunity in public employment. Following this a series of legislative reforms were introduced from 1969 onwards, firstly by the Northern Ireland parliament and later, after the Northern parliament had been prorogued in 1972, by the Westminster parliament. The Local Government Act (NI) 1972, the Health and Personal Services (NI) Order 1972 and the Education and Libraries (NI) Order 1973 introduced administrative changes within Northern Ireland. Included in the legislation was the establishment of staff commissions for all the new public bodies to promote fairness in personnel practices. The Northern Ireland Constitution Act 1973 provided for a legislative Assembly for Northern Ireland and made void any legislation by that body which discriminated against any person or class of persons on the grounds of religious belief or political opinion. Also, executive actions by Government and public bodies which discriminated on the grounds of religious belief or political opinion were made unlawful. The 1973 Act, which replaced the Government of Ireland Act 1920, also established the Standing Advisory Commission on Human Rights. In 1972 the Government established a working party to report on employment practice in the private sector. The van Straubenzee Report (1973) recommended that the primary aim should be to promote full equality in all aspects of employment opportunity. This was taken to mean more than the removal of discrimination. Three years later aspects of this report were put into legislative form by the Fair Employment (NI) Act 1976 which made discrimination, in both public and private employment, on religious or political grounds unlawful and established machinery for the promotion of equality of opportunity. A Fair Employment Agency (FEA) was established to receive complaints of discrimination and investigate the extent of equality of opportunity. Voluntary action on the part of employers was to be encouraged by promoting a Declaration of Principle and Intent which employers were asked to sign. In 1981 the Government announced that from March 1, 1982, tenders for Government contracts would not normally be accepted from firms unless they held an equal opportunities employer certificate issued under the Fair Employment Act. In 1989 a new Fair Employment (NI) Act was passed and included within its provisions compulsory monitoring of the religious composition of workforces and the outlawing of indirect discrimination. In addition, guidelines issued with the 1989 Act described permissible affirmative action policies employers might implement to try to lessen imbalances within their workforces. The above discussion establishes the basic context within which the research studies to be reviewed here were carried out Before this, it might be worthwhile examining the stages involved in the employment process. Figure 1.1 presents a simplified diagram of the various stages. The first stage involves the population who theoretically can apply for a particular position. In a divided society the primary limitations at this stage are the geographical distribution and demographic characteristics of the groups, although in many instances geographical constraints can be mediated by mobility (Cormack et al, 1980). Conversely, if there are restrictions to mobility for one group or other this will place greater emphasis on the geographical location of employment opportunities. The second stage involves those people in the population who are qualified for the post, in other words, the potential pool of applicants. Once again certain restrictions can operate at this stage. If educational or professional qualifications are differentially spread between communities in a population, this can set limits on the potential pool of applicants. Similarly, experience may be a factor in determining the pool and this may be differentially spread between communities, particularly if there has been a history of segregation in sectors of industry. The third stage involves those people in the potential pool of applicants who actually apply for a post. A number of factors can restrict the number of applicants from the pool, including unattractive conditions of employment, the extent to which potential applicants are aware of the employment opportunity and perceptions of discrimination. The second of these concerns advertising, for, if a job is not publicly advertised then the numbers from the pool who could apply is very limited: in Northern Ireland advertising jobs in only certain newspapers can restrict the number of people who are aware of the opportunity. The role of perceived discrimination is less clear cut, but can have the effect that potential applicants do not apply for jobs either because they feel it is a waste of time (they might believe they will be discriminated against) or alternatively, they believe they would be made to feel unwelcome even if they did get the job. In this way perceptions can restrict the number of actual applicants from the pool of potential applicants. An additional element in Northern Ireland is that Catholics, for a variety of reasons, are less willing than Protestants to apply for jobs in the security forces. The fourth stage concerns the selection of interviewees from the applicants. Clearly different employers will use different methods for this selection stage: all applicants who meet minimum requirements might be invited to take one or a number of tests, selection might be based on information contained on the application forms, or even on impressions created by the application. It seems likely that the more formal the selection method and criteria, the less likely there will be differential impact on members of different groups. The fifth and final stage involves the selection of recruits from those interviewed. While purely formal selection criteria are likely to lessen differential impact on members of different groups, in practice this selection for recruitment is likely to involve the highest degree of subjective choice on the part of interviewers. Problems created by this subjective element can, to some extent, be ameliorated by the use of structured interviews, using a number of interviewers, rather than one, or by using interviewers trained in interview techniques. Theoretically it is possible to devise selection methods that attempt to remove subjective judgements altogether: for example, if applicants take a test then recruits might be selected purely on the basis of performance; alternatively, recruits might be randomly selected from all the applicants who meet a specified minimum requirement. However, problems can arise even in this situation: see Harbison, 1989, for a discussion of problems identified in selection tests used by the Northern Ireland Civil Service. The general pattern suggested by this simplified model of the employment process is that the potential for formalisation reduces as we get closer to the point of selection. As the following sections of this review will show, most research, and most legislation, has concentrated on the earlier stages of the process: research has tended to focus on the extent to which formal methods are used and the role of mediating variables at various stages of the process; arguably most legislation has sought to formalise, as far as possible, the methods by which decisions are made.